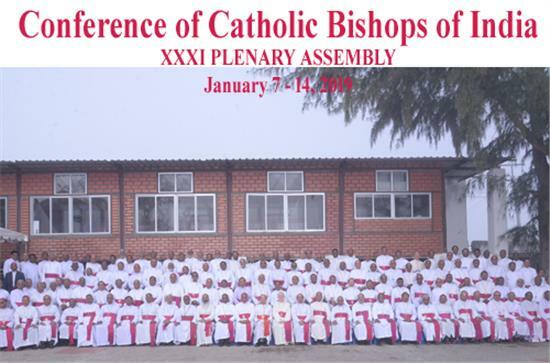 We, 133 bishops of the Conference of Catholic Bishops of India (CCBI), assembled at the Joe Animation Centre, Chingleput, Tamil Nadu, from January 7 to 14, 2019, for our 31st Plenary Assembly to reflect upon, pray, discern and respond to the theme: ‘The Joy of the Gospel’. This theme — which is the title of Pope Francis’ Exhortation Evangelii Gaudium (EG) — urges us to reflect more deeply on the demands of Christian discipleship. Impelled by Jesus’ promise: “I have said these things to you so that my joy may be in you and that your joy may be complete” (Jn 15:11), we go forth to joyfully and enthusiastically proclaim the Good News of Jesus Christ. We see so much that fills us with joy, consolation and hope. The fidelity, fervour and enthusiasm of so many Christians, lay groups and associations in different parts of India to make Christ known, loved and followed is truly exemplary and encouraging. The heroic witness to the faith of our Christian brothers and sisters — even to the extent of laying down their life for Christ, as seen in places like Kandhamal and elsewhere — is a sublime testimony of courage and sacrifice. The silent witness of so many lay faithful, consecrated persons and priests who live their Christian commitment by walking the path of love, service and sacrifice is truly the effect of an outpouring of grace, expressed so beautifully by Pope Francis in ‘Gaudete et Exsultate - Rejoice and be glad’ on the call to holiness in today’s world. We see the urgent need to further strengthen our faith, and we hope to continue extending our loving service to all people — in particular, the Dalits, tribals, women, migrants and refugees — so as to remove all traces of injustice, exploitation and oppression in our society and in the Church. Many challenges, both internal and external, confront us in our mission. Among the internal ones is the need for: (a) a continuous spiritual renewal of bishops, priests, consecrated and lay faithful to inspire us to more joyfully proclaim the Good News; (b) to instill in ourselves a confidence to overcome any fear generated by some incidents of opposition and violence; (c) to find means to reveal more effectively the ‘merciful face’ of Jesus; (d) to go forth to the peripheries, instead of seeking security in institutions; (e) to take more decisive measures for promoting the welfare of Christians who suffer from various forms of discrimination. Some external challenges confronting the Church are: (a) communal forces that threaten to deny some communities their religious identity and rights; (b) economic policies that favour the rich and adversely affect the ‘poor’; (c) media sensationalism and the spread of fake news. God’s Word moves us to preach the Good News. Saint Paul exhorts us: “In the presence of God and of Christ Jesus …. I solemnly urge you: proclaim the message; be persistent, whether the time is favourable or unfavourable” (2 Tim 4:1-2). Every baptized person is obliged to joyfully preach, practise and propagate the Gospel in all circumstances. The Church’s call is to be the seed, servant and sacrament of the Kingdom of God, announcing through her words, works and witness the “fullness of life” offered by Christ (Jn 10:10). This is clearly articulated in the documents of Vatican Council II (1962-65) such as Ad Gentes. Thereafter, Evangelii Nuntiandi of Pope Paul VI (1975), Redemptoris Missio of Pope John Paul II (1990) and other documents have provided the impetus to proclaim the Good News with new ardour, methods and expressions. Pope Francis reminds us of the personal call for mission. Each of us not only ‘has’ a mission but also ‘is’ a mission: “I am a mission on this earth; that is the reason why I am here in this world” (EG, 273). Keeping in mind this call to us, we pledge to continue striving to be joyful and selfless shepherds according to the heart of Christ. All our ministries will be effective only if they spring out of a personal and loving relationship with Jesus Christ strengthened through a life of daily prayer and contemplation. to all our Faithful: You are “temples of the Holy Spirit” (1 Cor 6:19) called to be everyday “saints next door” (Gaudete et Exsultate, 6-9). Make the world a better place with your love for God, overflowing into selfless deeds for justice, peace, harmony and care of God’s creation. to Christian Families: Your vocation is to be the “Domestic Church” — called to be holy and happy. Always bear the Good News at home, in the neighbourhood, in places of study and work, ever seeking to go forth and widen ‘family circles’ by loving and serving all. to the Youth: You are the hope of the Church and Society! Stay creative in mind, loving at heart, loyal to the Church and lively in your steps to joyfully follow the ways of Our Lord Jesus, so that the freshness and appeal of the Good News may shine forth brightly in your words and deeds. to the Clergy and the Religious: You represent the person of Christ in the Church and in the World! Strive to be selfless missionary disciples, shunning every form of clericalism and careerism so as to be faithful to your vocation – active in the Spirit, effectively revealing the merciful and joyful face of God to all people, especially the poorest of the poor. In all our ministries—especially pastoral care, education, healthcare and social action — let us constantly seek to announce the Joy of the Gospel to all, so that God’s Kingdom may blossom in our world today. Christ assures us: “I am with you till the end of the age” (Mt 28:20). Encouraged by this promise, we can say anew and aloud: “I can do all things in Him who strengthens me” (Phil 4:13). In her Magnificat, Mary, our blessed Mother, wonderfully expresses the joyful trust and unconditional surrender of a disciple of Christ. Invoking God’s blessings upon each of you, our dear sisters and brothers in Christ Jesus, let us echo Mary’s song: “My soul magnifies the Lord, and my spirit rejoices in God, my Saviour!” (Lk 1:46-47). May Mary, the Star of the New Evangelization, and Joseph, her chaste Spouse, guide us as we generously and joyfully bear and ‘be’ the Good News to all people.